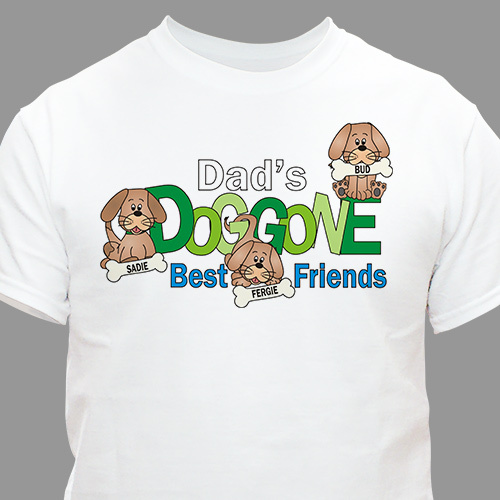 Our Dog Lover Personalized T-Shirts make a great gift for any dad that adores the family dog. This Personalized Shirt will make it known who loves the furry four-legged buddy the best. Our Personalized Dog Lover T-Shirt is available on our premium white 100% cotton Personalized T-Shirt, machine washable in adult sizes S-3XL. Also available in Ash Gray. Includes FREE Personalization! Personalize your Dog Lover T-Shirt with any title and up to 30 names. Example: "Grandpa's, Dad's, Papa's, etc." The persons who received these shirts had just put their second dog down three days before Christmas. The first dog was put down two years ago. They loved their dogs. They very much appreciated the shirts with the dogs' names; it made the gift very personal, special and meaningful. They said the shirts actually made them feel a little better.